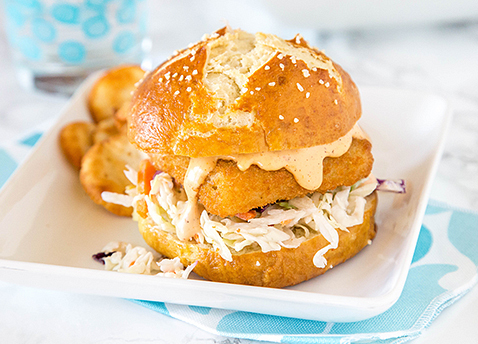 The best part about this Spicy Fish Sandwich from Dinners, Dishes, and Desserts isn’t that it’s topped with a spicy tartar sauce or easy-to-make coleslaw. It’s that it’s just the right size to hold with one hand, so you can eat two at a time. Preheat oven to 425°F. Cook fish fillets according to package directions. In a bowl mix together mayo, mustard, vinegar, and sugar. Toss with coleslaw mix. Season with salt and pepper to taste. In a small bowl mix together tartar sauce and cajun seasoning. Add hot sauce to desired heat level. Slice each sandwich bun in half. Top each bun with about 1/2 cup of coleslaw and 1 fish fillet. Drizzle spicy tartar sauce over each sandwich. Serve with additional tartar sauce on the side for extra spice. 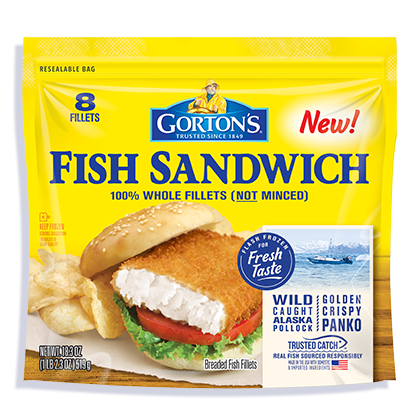 100% whole fish fillets covered in a crunchy breading; perfectly shaped for sandwiches. Find your favorite fish online or in a store near you. Sign up for our e-newsletter to get the latest coupons, special savings, and quick meal ideas. In the Alaska Pollock fishery, mid-water trawls are utilized, which include safety catches to allow any other wildlike that might be caught to escape. Sign up for our weekly Crew Report newsletter to get the latest coupons, special savings and quick meal ideas from your favorite bloggers.